You guys know I love anything citrus… and if you didn’t, you do now! 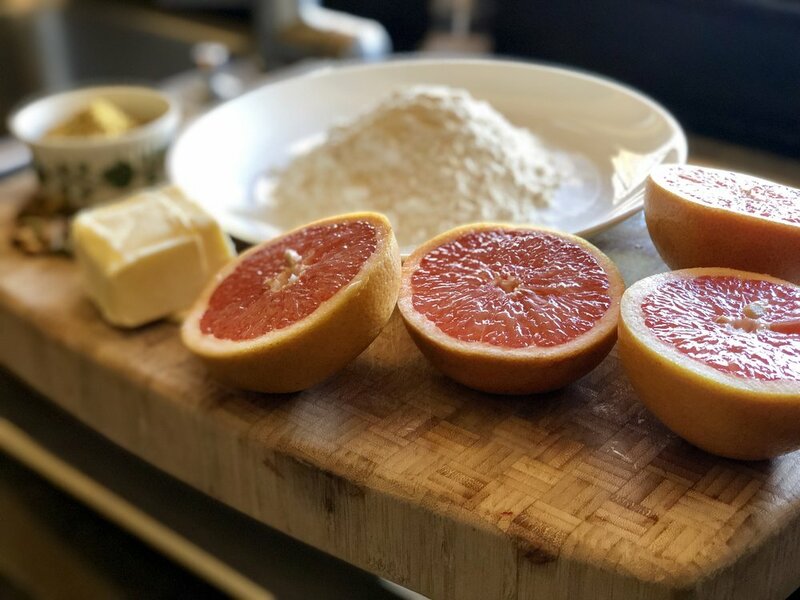 So we’re rolling into spring and some of that late winter fruit, like grapefruit, is still fresh and abundant. A variety of grapefruit that my Creek County self is fond of is the Texas Ruby Red. Vibrant in color, sweet, and there’s a ton of it here in Oklahoma. Thinking a lemon meringue pie sounded good, not excited about making another Key-Lime somethings, I decided to explore the grapefruit and explore, conquered, and devoured, I did. Pairing it with a pistachio crust and even adding ground cardamom to the grapefruit curd (my friend Dr. Terry Allen introduced me to the paring of Orange and Cardamom, so why not grapefruit) seemed like the perfect match. It also gives the nod to my Persian influences, so there's that little nugget of info for you. Are you guys digging my stream of thought? Seriously this recipe makes one standard size fruit tart or six to eight smaller tartlets. For the recipe, I’ll explain my method in terms of the tartlet. You’re bright enough to make it work for one single tart. However you do it, tart or tartlet is entirely up to you. Let’s get to it! Place all of the ingredients, except the egg yolks, in a food processor. Pulse the mixture into a crumbly meal. Add the egg yolks and process until the dough comes together into a ball. If the dough seems too dry, add a tablespoon of cold water to bring it all together. Turn the dough out onto a floured surface. Work into a ball, then flatten to a thick disk. Wrap in cling film and refrigerate for at least one hour. When you’re ready to blind bake, preheat your oven to 400 degrees. Prepare your tartlet pans by buttering or spraying the bottom and sides. Cut parchment paper rounds large enough to fit inside each tartlet pan and to hold dry beans or pie weights. Roll the dough out on the same floured surface to 1/4” thick. Place a tartlet pan face down on the dough. Using a paring knife cut around the pan 1/4’-1/2” wider than the pan. This excess allows covering the sides of each dish. Loosely fit each pan with the dough cutouts, remembering dough shrinks when baking… so don’t “stretch” the dough! Fill each of your tartlet pans and then trim off the excess. Prick the insides, bottom, and sides, with a fork. Place the parchment paper cutouts in the tartlet pans and fill with dried beans or pie weights. Place the pans on a baking sheet and place in the oven. Bake 10 minutes to set the dough. Remove the parchment paper and beans carefully from each tartlet pan. Place back into the oven and bake an additional 5-10 minutes until the dough is golden brown. Remove and allow to cool in the pans. Add the egg yolks to forth dough. In a medium sized pot, add the sugar, salt, cardamom, and grapefruit zest. Pour in the grapefruit juice and gently heat to a simmer, stirring to combine the other ingredients. In a mixing bowl add the egg yolks and cornstarch. Mix to a pale yellow slurry. Temper the hot grapefruit juice into the egg yolks a little at a time while continually whisking. Once half of the hot juice is mixed in add all of it while whisking. Pour the mixture back into the pot and gently cook on the stovetop, continually stirring, until the mixture thickens. Remove from the heat. Pour the mixture through a strainer to remove any clumps or curdles. We want lovely smooth grapefruit curd. Add the butter a tablespoon at a time and mix in. Cover the curd’s surface with cling film, so a “skin” doesn’t form, and cool. I placed mine over a bowl of ice and stirred intermittently because I’m impatient. 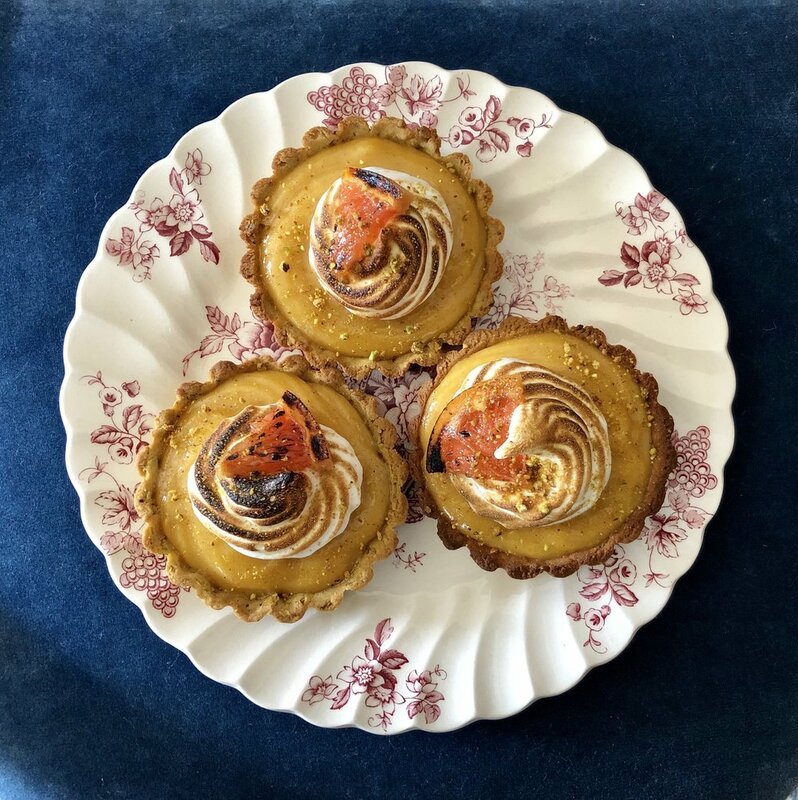 Fill each of the tartlet shells with the chilled grapefruit curd to the very top. Add the egg whites to a CLEAN stainless sleet mixing bowl. Egg whites will not whip if there is a trace of fat. Make sure your egg whites have NO YOLK, and your bowl is free of any grease or fat. Begin whipping the whites to a soft peak… almost like a cloud. Add the cream of tartar and mix a little stiffer. While the mixer is running sprinkle in the sugar a little at a time. Mix in all of the sugar and whip until your meringue is stiff and glossy. Spoon or pipe the meringue onto your tartlets however you like. With a kitchen blow torch (they’re so fun) or using the broiler of your oven, broil the top of the meringue until golden toasty. However you do it, be careful and keep an eye on the meringue. This is no time to check Instagram. Serve your tartlets right away… and get ready for sweet citrus heaven!